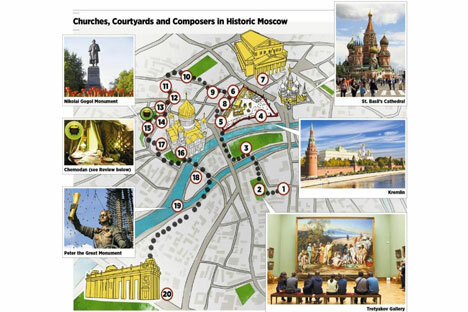 If you have some free time during your trip to Moscow, a picturesque walk around the Kremlin is a great way to soak up Russian history and culture while enjoying the capital’s vibrant downtown scene. 1) Zamoskvorechye district (literally, “beyond the Moscow River”), one of the city’s loveliest central sights and viewpoints. 2) The Tretyakov Gallery is Moscow’s national collection of pre-20th century Russian art. 3) Bolotnaya Ploschad (Marshy Square). 8) Manezh was an imperial parade ground in the past, now an exhibition hall. 9) The elegant, neoclassical mansions across the road are part of Moscow State University, founded in 1755. 10) Conservatory, heart of many of the city’s musical traditions. 11) “Theater at Nikitsky Gate”, where you can listen to Russian songs and drink vodka in the courtyard on summer evenings. 12) Museum of Eastern Arts, packed with lilac silk and turquoise ceramics. 14) Confael chocolate shop, where you can buy an edible postcard of St. Basil’s Cathedral. 15) Statue of 19th century satirist Nikolai Gogol. 16) Christ the Savior Cathedral, the tallest Orthodox church in the world. 19) Zurab Tsereteli’s statue of a nautical Peter the Great. 20) Gorky Park, now a riverside Wi-Fi paradise of outdoor art and yoga classes, frequented by everyone from grannies and hipsters to young families with strollers.